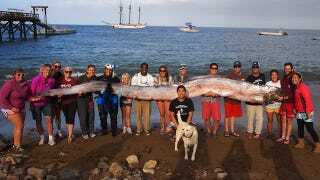 A marine science instructor has found this gigantic 18-foot-long oarfish—one of the most elusive animals on Earth—in Toyon Bay, 22 miles off the Port of Los Angeles. A horrible beast that, sadly, is too flabby and gooey to eat. Here's a living oarfish captured on camera, a very strange event.